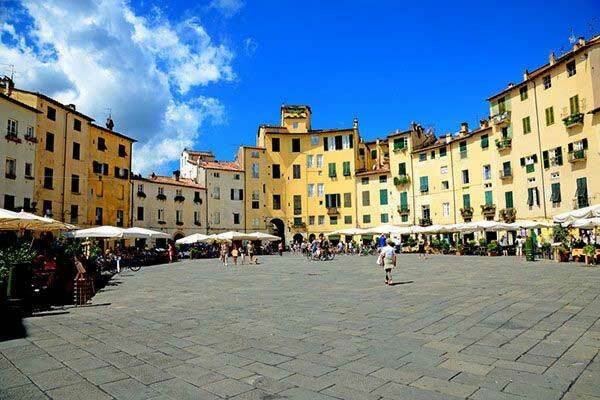 Sometimes overlooked by tourists who are understandably caught up in the museums and other attractions of Florence, the ancient city of Lucca is well worth a visit in its own right. It is perfect for a daytrip, or if you have more time, it is also a great base from which to explore Pisa and Sienna to the south, Versilia and the coast to the west, or the Apuan Alps of northern Tuscany. This convenient central location in Tuscany has caused Lucca some grief in its over 2,000 years of history, but being the center of much conflict from Roman times all the way to the 16th century and beyond gave rise to Lucca’s most distinctive architectural feature: the impressive stone walls that surround and enclose the historic district of this fascinating Italian town. Today, these walls have been converted to a promenade for pedestrians and path for cyclists. 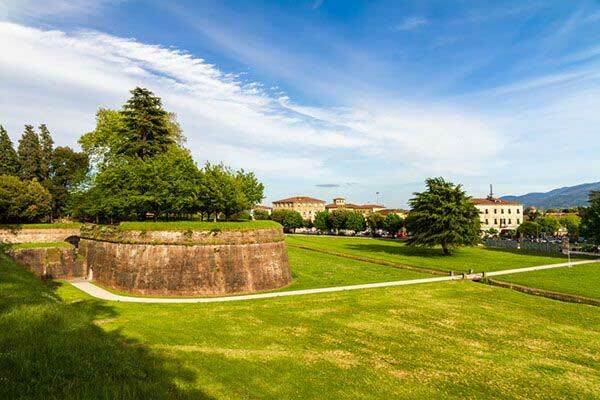 Known as the Passeggiata delle Mura Urbane, the street atop the walls links the bastions that once were important military posts. It passes through the Bastions of Santa Croce, San Frediano, San Martino, San Pietro/Battisti, San Salvatore, La Libertà/Cairoli, San Regolo, San Colombano, Santa Maria, San Paolino/Catalani, and San Donato; and over the gates (Porta): San Donato, Santa Maria, San Jocopo, Elisa, San Pietro, and Sant’Anna. What is particularly striking, especially in spring and fall, is that each of the four principal sides of the structure is lined with a different tree species than the others. 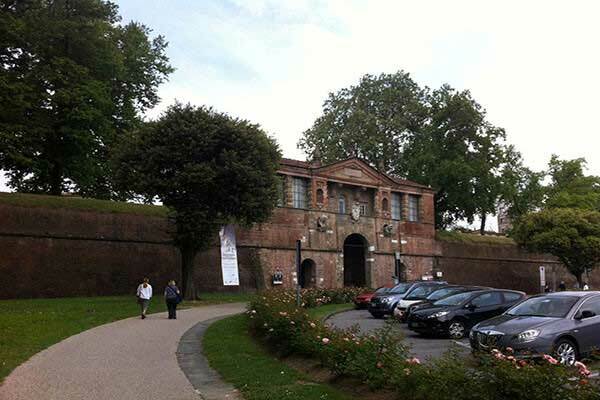 The areas around the walls have been taken care of as well, with plenty of well-maintained grassy areas—in essence, it is a park system that surrounds the central city and serves as a place to relax, take a stroll or enjoy a gelato—that manages to shutout the modern world outside, and preserve the timeless world within. Since cars are not allowed inside the walled section, once passing through a porta the illusion of stepping back in time is complete. On our visit to this part of Italy we were staying in a two-bedroom apartment in the heart of Florence, and we elected to rent a car and drive to Lucca, a trip of just over an hour. It is also very easy to take a train or a bus (trains tickets are about $11, buses $14), but we wanted to be free to do a little exploring in the surrounding countryside on our own. I particularly enjoyed this option, as the car we were given was a terrific Alfa Romeo with leather interior and a 6-speed (that’s right, 6) manual transmission. Move over, Mario Andretti. Arriving at Lucca, we found plenty of signs directing us to the historic district. We easily found free parking just outside the walls, and entered via the Porta San Pietro. The first thing you notice is the quiet; almost immediately, the stone and earthen ramparts that for so long kept out invaders now blocks the traffic noise of the busy city. Each step you take further into the walled city feels like a step back to a simpler time. Of course, things are not always so quiet in Lucca. Like Ravello on the Amalfi Coast, Lucca has become something of a mecca for musicians from around the world. 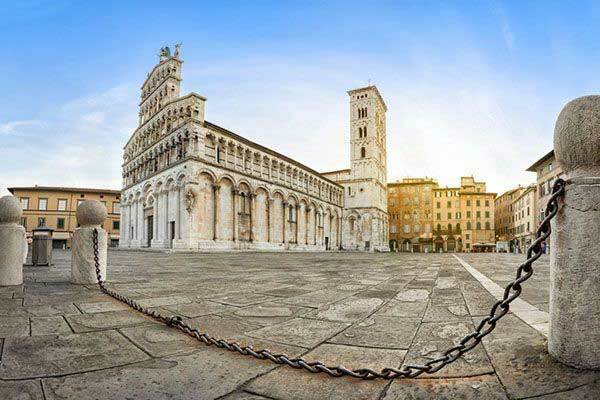 The annual Lucca Summer Festival held in the Piazza Napoleone has seen such artists as Eric Clapton, Elton John, Santana, Tracy Chapman, and more. Naturally, the city that was the birthplace of Giacomo Puccini (La Bohéme, Madam Butterfly) also hosts an Opera Festival in July/August. Lest you think the city is too high-brow, keep in mind that it also hosts Europe’s largest Comic Book and Gaming festival each October. There were no large festivals going on during our visit, but just touring the city is a celebration in itself, on a warm, sunny day in May where every tree and flower seemed to be in bloom, and the red-roofed buildings stood out against the crisp blue sky. Our path took us through the aforementioned Piazza Napoleone, senza Elton John, but ringed with 15th century architecture, highlighted by the Palazzo Ducal de Lucca. The Duke’s Palace has been transformed into a part museum, part events venue. You can walk through eight centuries of the Palace’s history, enjoying the marble Hall of Statues, and beautiful renaissance paintings. There is also a museum dedicated to chronicling Italian Emigrations. From the Plaza it is a short walk down the Via Pozzoterelli to the Chiesa de San Michelle in Foro, Roman Catholic church with a distinctive and ornate façade, soaring up to the heavens. The history of this church is almost the history of Lucca. First mention in 795B.C. as part of the Roman Forum (hence in Foro), it was rebuilt in the 11th century by order of the Pope and dedicated to the Archangel Michael. The incredible façade of the church was added in the 13th century, and the bell tower on the back corner’s construction spanned the 12th to 14th centuries. There are at least seven other historic churches in the walled city, and more than ten museums, palaces and gardens to explore. For those that enjoy shopping, there are also plenty of stores to peruse. As you would expect in Italy, there are some great places to shop for the latest fashions or that special bottle of wine, but there are also some quaint bookstores, antique shops, and plenty of places for souvenirs. Definitely something to put on your must-see list is the Piazza dell’Anfiteatro. It is rather unique as a “village square” in that it is actually an oval. Its unique elliptical shape exists because it is built on the site of a Roman Amphitheater, with buildings now ringing the outline of the arena. It is thought that the amphitheater dates from the 1st or 2nd century B.C., and that it held as many as 10,000 spectators. The piazza can be entered through one of four gates, each station symmetrically around the ellipse. There is a cross carved on a tile in the center that points the way to the four gates. Originally refurbished as a marketplace, it is now mostly private homes and business, and frequently there are tented stalls set up during the weekends. We took advantage of several outdoor cafes to take a break and enjoy some great Italian food at the Restaurante Bollicina. They serve a varied menu, with heavier pasta dishes, pizza, light snacks, prosciutto platters, salads, and of course every meal in Italy comes with wine (when in Rome, or thereabouts, anyway)—and to refuse a shot of limoncello (lemon liqueur) after the meal “to aid the digestion” would just be rude. Unfortunately for us, our time at Lucca was just about up if we were going to miss the Florence evening traffic. So it was with a heavy heart, full belly, and slightly unsteady legs that we followed the Mura Urbane atop the wall back to our car and the modern world. But we were glad we had taken the time to take a look at Lucca, and vowed to return one day.